A rendering taken from a City of Boston handout illustrates what new homes will look like once they are built on Callender Street in Dorchester. Some of the city-owned parcels speckling Boston have stood vacant for decades, unused and frequently described as “missing teeth” in the face of a neighborhood. New hope for those properties is on hand, the Walsh administration says, through a program geared toward building one- and two-family housing. The Neighborhood Homes Initiative, which will soon see its first units under construction, is designed to turn some 250 city-owned parcels into housing affordable to a range of middle-class home buyers. 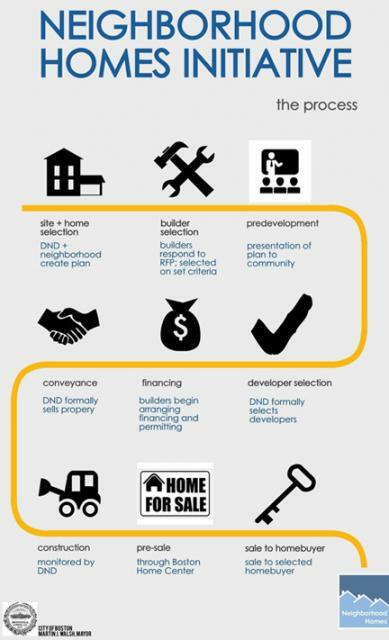 The plan implements a unique streamlining process with multiple stages of neighborhood approval to ensure that whatever house is built on a lot fits in with the surrounding community. The process started with a survey of city-owned parcels shortly after Mayor Martin Walsh came into office, said housing chief Sheila Dillon, that identified hundreds of small, vacant lots primed for small-scale development. Those lots are grouped into development “packages,” so a developer or builder will take on multiple units with different designs. “Being very conscious that there are small developers out there who can’t handle large packages, we have made some of the packages very small to really encourage local participation,” Dillon said. How the Neighborhood Homes Initiative WorksEvery step of the initiative is taken with an eye toward reducing friction in the development process. Before a Request for Proposals (RFP) is released, before a developer comes on board, before designs are finalized, and long before the land is sold, the Department of Neighborhood Development (DND) meets with abutters to get their input into the lot design. City architects initially prepared slews of possible one- and two-family house prototype designs “that would complement the existing street in the existing context,” Dillon said. Through frequent community meetings, neighbors then weighed in on gables, porches, window height, setbacks, and the like. With months or specific input under their belts, DND then put out RFPs for bundles of lots. Most of the interested respondents have been small-scale developer and builders, Dillon said, who can be connected with other small companies through the city. Of the 172 projects currently in the 255-unit pipeline, 41 parcels are in Dorchester and another 75 are in Mattapan. Two RFPs located in Dorchester are now online through DND’s website: The Callender | Tucker Street grouping and the Glenway | Roxton Street grouping. Courbanize.com includes a searchable database of Neighborhood Homes projects. Construction is set to start soon on the first project of the Neighborhood Homes Initiative, kicking off in Dorchester on Trull and Ware streets. Kevin Maguire, a South End resident and partner at Oxbow Urban LLC., is the small-scale developer tasked with the Trull | Ware project. His development group is working with CAPE Construction on the two lots and will later be tackling a different bundle of parcels near the old Boston Tech High School property in Roxbury. In selecting Maguire, the initiative considered his history of constructing middle-income housing and his desire to direct some of his skills toward his home city, he said. Developers back into the price points, Dillon explained. Because DND streamlines the process as effectively as it can, and provides easy access to resources for interested developers and builders, the houses come with strict sale prices. Affordable homes are slated for income levels at 80 and 100 percent of area median income (AMI), according to the Department of Neighborhood Development. Single-families will sell for $294,000 (80 percent) and $353,000 (100 percent). Two-families will sell for $385,000 (80 percent) and $425,000 (100 percent). The Boston Home Center will help buyers for the moderate- and middle-income homes, ensuring that any necessary mortgages are in order and that potential homebuyers find new housing best suited for their needs.